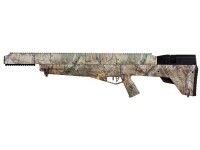 A Realtree Xtra Camo design. Get ready for silent treatment! The last thing you need when you hunt is a loud report. SoundTrap baffles suppress the report of the Bulldog's shots. If your big bore has to announce its power by making a lot of noise, then you need the Bulldog. With an extra-long rail above the barrel and a shorter one under the muzzle, you can accessorize to your heart's content. Add a flashlight, scope, bubble level and/or laser to hunt from dawn til dusk. Optical accessories made for the AR platform can be fitted to your bullpup. 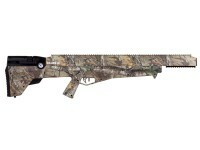 Since this is a .357-caliber gun, you're no longer limited to smaller pests and game traditionally listed as airgun fare. One pest that's destroying much of American farmland is the feral hog. And the Bulldog is a great tool for eradicating it. 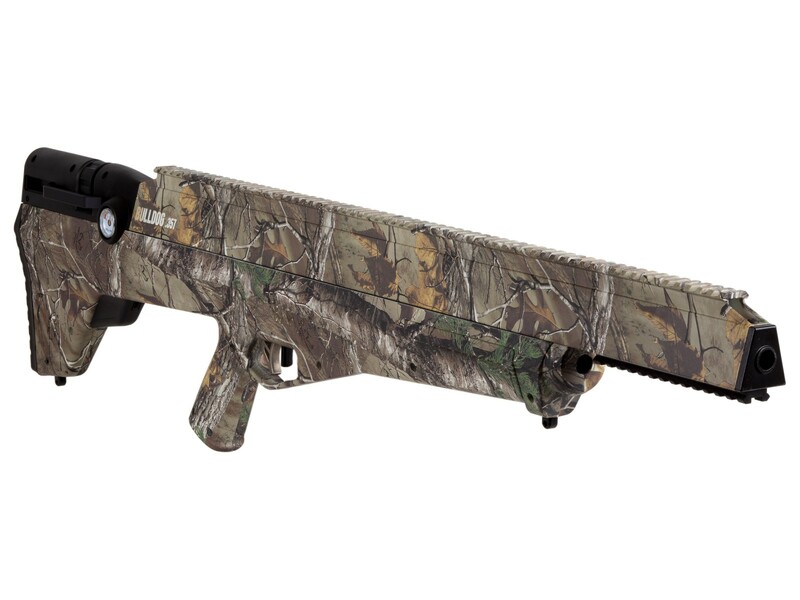 You can also take smaller pests and game at further distances than you would with smallbore airguns. Lefties! 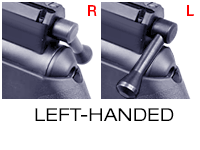 Add our service to move the sidelever to the other side of the gun. It's worth the price! 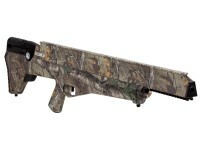 Things I liked: Bought this bad boy little over a month ago but no time to take it out and shoot it, at all! Been waiting on delivery of compressors, connection parts, and so on from this vender and others. Been dying to pull the trigger other than dry firing it a couple of times to check the decibel output. Long story short, went through a really nasty divorce, psycho ex lied a bunch and secured MY house from me, stole my guns, ammo, furniture,.... Yada, yada, yada. She also threw my deer heads into an open shed with no doors for over a year where rodents/squirrels ate the noses off of my mounts; 4 in total. Thousands of dollars later I've got my house back for a year and a half now. I'm fixing everything, buying new furniture, blah,,blah blah. All the while I've been waiting on the opportunity to get revenge on the critters that vandalized my mounts. Today, victory!! Fat squirrel chewing on a skull mount at ten yds, first shot ever(no practice), smoked him!!! Squirrel stew! Any questions? Things I would have changed: Never marry again and buy more air guns and ammo! What others should know: Don't get married and if you do, don't leave your guns, ammo, and mounts behind, ever! BTW, under current law you can't have your firearms if a protective order (or false claims of violence) are brought against you but you can have an air rifle or bow and arrow (air and string). So, if the crap hits the fan, you can still enjoy your hobbies or shooting but it will be limited to air gunning. (FYI, I have my gun rights back but am starting to dig this air gunning thing!) 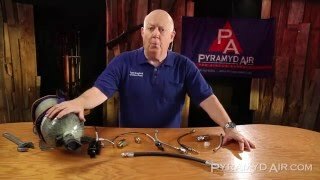 Thank you pyramid air for helping to restore a part of me that was taken against my will and my rights. Oh, regarding the Bulldog......it's very accurate right out of the box. Dead squirrels don't lie (well they don't say much). Things I would have changed: Trigger is a bit heavy but doable. Noise is extreme, perhaps work on that in future designs. What others should know: Shoot Predator polymags or JSB and you will be amazed at the accuracy. Things I liked: Everything I enjoy shooting!. Lots of power. Things I would have changed: Fill cover is junk . mine broke off and Crosman did send a new one right out fast. What others should know: Ammo is very expensive. Uses a lot of air fast so I would use a fill Tank. 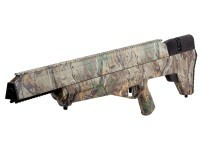 Texas requires 215 fpe for hunting medium size game, in at least 30 caliber. The spec on this gun is 200. Is there ammo that can accurately delivery 215 muzzle energy ? No harder than any other gun with a similarly sized cylinder. Pumping is never easy, but from 2000-2500 psi, if you're in decent shape, should be very doable. Benjamin Bulldog .357, shrouded: Big bite, little bark!